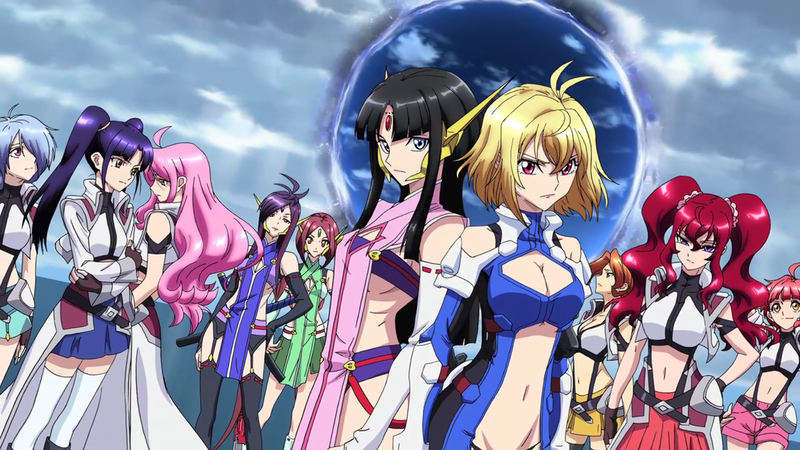 I saw this show at the same time I was watching “Atasuka no Yona”, but “Cross Ange: Rondo of Angels and Dragons” (“Kurosu Anju Tenshi to Ryū no Rondo”) takes it in a different direction. We start off in the Empire of Misurugi. We are approaching the 16th birthday of Angelise Ikaruga “Ange” Misurugi (she is scowly blue up there), at which time, she will be coronated and become the official next in line to the throne. She is loved by all, despite living the cloistered life that usually accompanies royalty. However, her brother, Julio, engineers a coup, exposing the fact that she is a Norma! Are you kidding me? What a betrayal! Burn the witch! Stripped of her title and her privileges and her standing and her family (Mom is killed saving her and Dad is later executed), she now gets to spend the rest of her life (however long or short that may be) fighting these dragons and protecting a world that neither wants her nor cares for her, but still needs her. Oh, yes, and as the ‘new kid’ and ex-royalty, she is grandly detested by everyone here. Well, not by all of them, but the ladies who matter can’t wait for her to be turned into dragon dross. The show is two well-defined arcs. Arc 1 is her trials and tribulations, going from princess to peon, and becoming a rather fierce and combative soldier. Arc 2 is the revelation, as to what is REALLY going on and what it all means. Sorry, massive plot point, so let it unfold for you. Yeah, the fan service. For some odd reason, they have to wear these bizarre outfits. Look, if you are riding what they call a para-mail (which is a flying motorcycle that can transform into a Gundam), it gets kinda breezy up there. Aren’t you worried about the cold and whatnot? No, for these are tough broads and tough broads don’t need things like warmth! Well, they do need warmth, but it’s emotional warmth. Since there are no men, it is not uncommon for them to rent a special room for canoodling. No, you don’t see anything; you don’t ever see anything, but there is certainly much implied. I am not going to run down the cast, as it is capacious on both sides of the fence and some necessary folks weren’t available when the above snap was taken (detention and whatnot; you know what Photo Day is like, anyway), but there is a huge amount of duplicity, double dealing and down and dirty behavior that makes one realize the only person to trust is yourself….and your mechanic. You gotta trust your mechanic. And remember, it’s first run until you’ve seen it. I don’t need anyone.